At seven in the morning, my husband Kurt unzips our tent door from the inside. Through the open flap and the a.m. mist, we see a balding man in shorts and a ragged T-shirt approach with a dog. “I guess you didn’t see my no trespassing sign over there,” he states matter-of-factly. 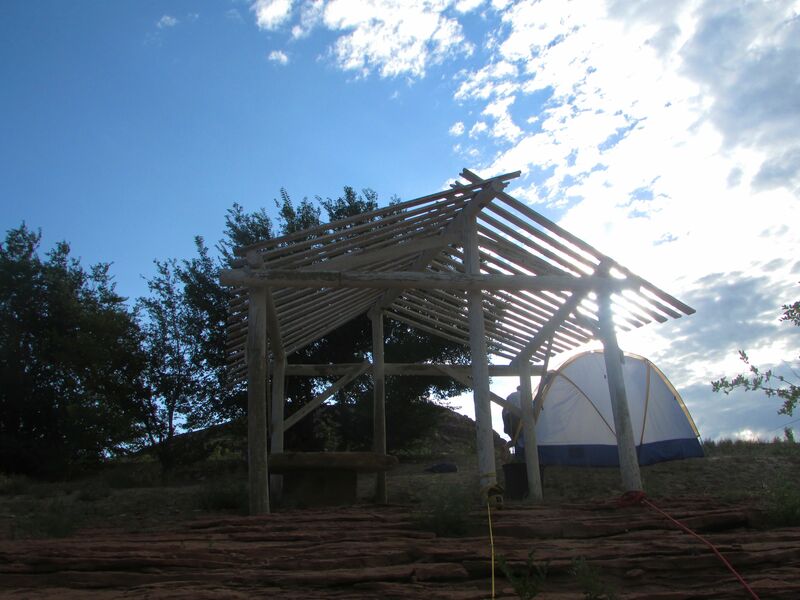 Our raft secured to the pergola. The owner of the private land on which we had just tented without permission, Ewell, stands just outside our “illegal” nylon shelter. Kurt and I expected a scenario like this but we still aren’t ready for it. “We are so sorry,” I begin to apologize and Kurt gets out the tent. “We have kids,” I blurt out. Eddie and Kasey being licked by Odie. “So, basically, you guys were in trouble,” he says and then comes closer to the tent. “Let me see these kids,” he moves the unzipped flap over and his labrador bounds through, tackling my son Eddie and licking him and my daughter Kasey all over. Leave it kids and a dog to break the ice. 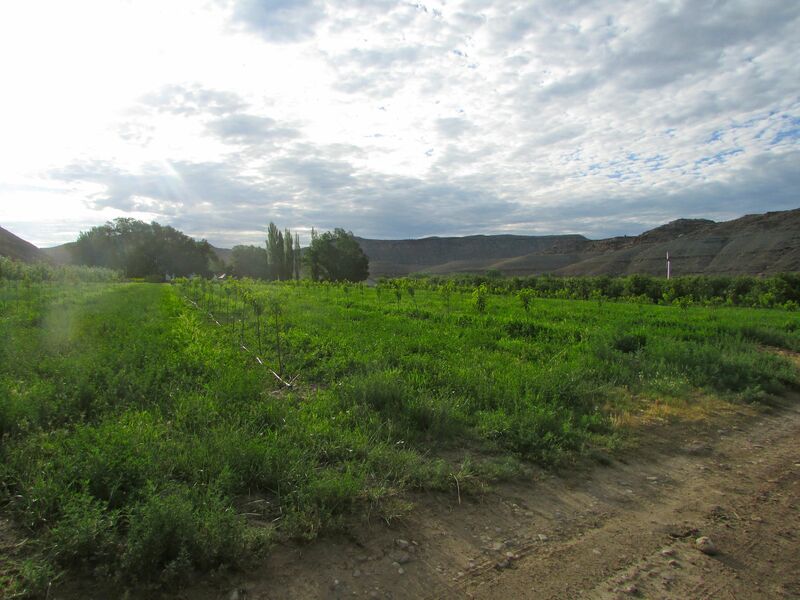 And we needed to break the ice since we were completely staked out on this guy’s property, which turned out to be an orchard next to the Gunnison River. This was not our first trespassing incident or unapproved stay during our ill-fated multi-day river trip. The whole excursion had been a series of bad decisions. The night before we launched our raft, we camped in Delta, Colorado, a ranching town, and we pitched our tent on what we thought was a designated tent sight in an RV park. At nine o’clock p.m., the RV park office was closed. The spot we chose looked free and clear. As it started raining, we hurried to set up the tent. While Kurt visited the office the next day to settle up, Eddie, Kasey and I waited in the van with our raft on its attached trailer. Meanwhile, one of the residents of the RV park ambled over. He first asked questions about our raft and where we were headed. Then he shared his life story. “You see, when I set out after I retired, I was headed for a mountain town, but I stopped here. And, well, here I am today in Delta,” he moved closer to the van’s open window. “It seems like a pretty nice town,” I said trying to think of a response to fill the awkward silence. “There’s ladies in Grand Junction,” he continued. 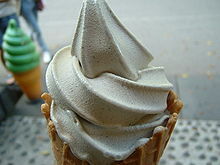 “My two weaknesses are ice cream and ladies — and not in that order.” He chuckled and seemed to look for reinforcement. I sort of smiled and then looked over to the office to see what was taking Kurt so long. “I’m 70, but I still got it,” he maintained while he pulled on the front of his pants. Kurt finally came back to the van while Ladies’ Man was now telling us that Grand Junction had dancing, too. 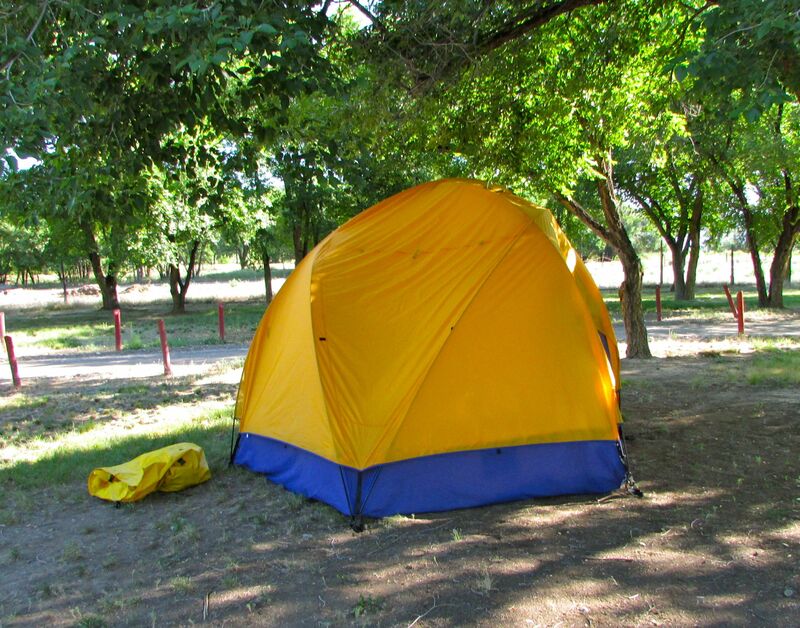 “We weren’t supposed to tent at the site, but the owner seemed happy with $15,” Kurt informed me of our first unapproved stay. Kurt rigs our raft. LIttle do we know the adventure we have ahead. Next at the boat launch we got the boat loaded — “rigged” — and Kurt explained his plan for a shuttle. 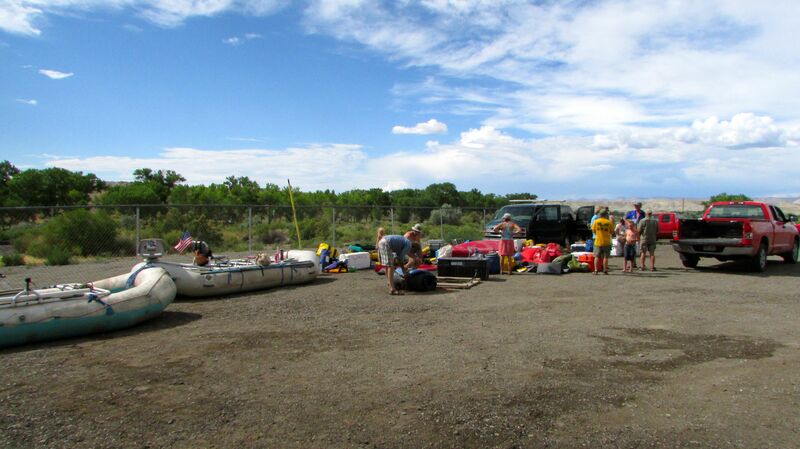 For any river trip, you need to get your vehicle to the takeout point, which, in our case, was 30 miles away, and then you must have a new ride arranged to get you back to the launch site. What? Seriously? That was the plan. Hitchhiking back to his wife and kids. Brilliant. 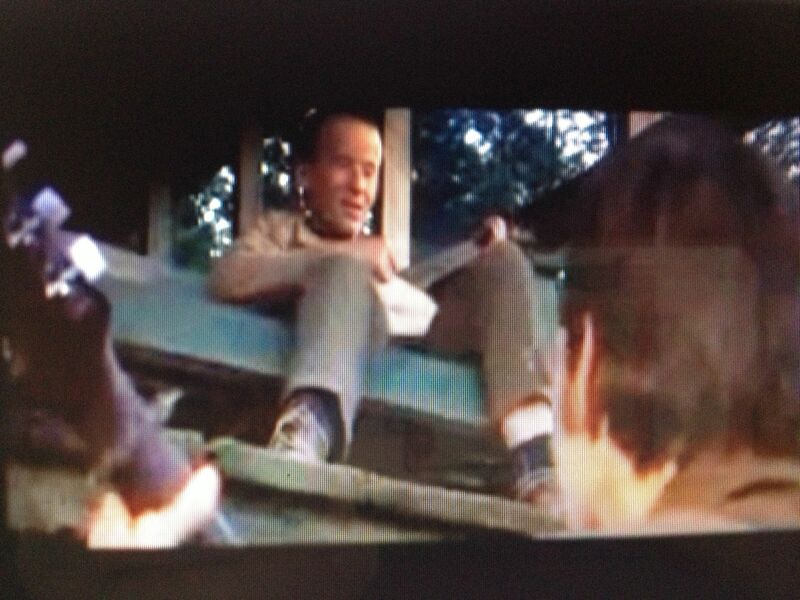 Why was an off-key “Deliverance” rendition of “Dueling Banjos” going through my head? “I’ll be fine. I have my life jacket, so drivers will know I’m a boater,” Kurt held up his well-worn faded orange life jacket. This was a horrible plan, but of course we didn’t have any other plan. You can’t really have a plan B when you don’t even have a plan A. 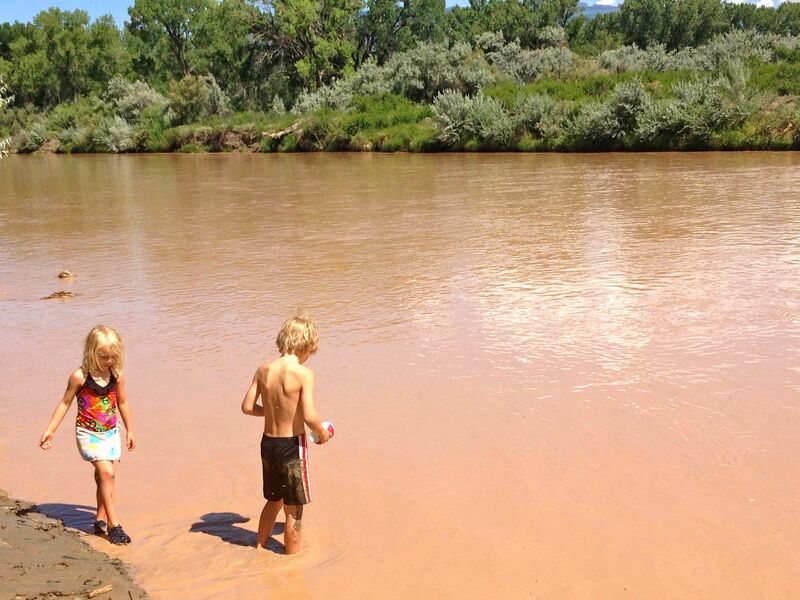 So Kurt took off while the kids played in the flat river water that, due to recent rains, looked like a melted Frappuccino. Ultimately, after nearly two hours, Kurt came back, unsuccessfully, with the van and trailer. Kasey and Eddie play in the melted Frappuccino water. We then decided to push off with no shuttle set. Brilliant. Eventually, we were supposed to meet up with friends who had launched the day before. Needing to cover 12 miles, we had gotten off to a substantially late start. However, the river was calm and the weather was good, so we just enjoyed boating. 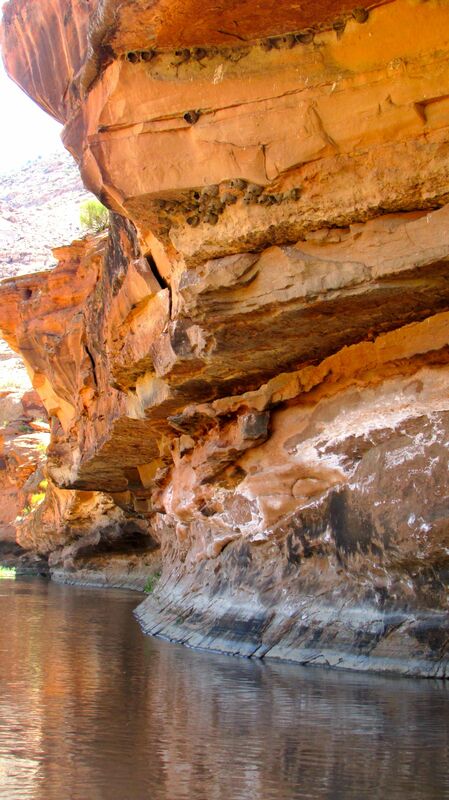 After a few hours, we entered the canyon area and marveled at what the river had carved out. Consulting a map, however, we realized we were only about half way to our destination. “Why did Michael lie, Dad?” Eddie asked. This is Jeremy Wade territory. “I don’t think Michael lied, Eddie. Maybe he was just confused or misinformed.” I tried to restore our friend Michael’s reputation. The sun lowered and the brown river started resembling the kind water “River Monster”’s Jeremy Wade frequents to fish for behemoth, mutant catfish that swallow small children whole. It definitely looked like the kind of habitat where anacondas lounge on the mucky bottom. Unfortunately the moon was just a sliver that hid behind clouds most of the time. I didn’t worry about the appearance for long because soon we couldn’t distinguish the color of the water. It was too dark. Kurt broke out the headlamps and flashlights. “Steph, what’s up ahead?” he barked. “I don’t know because I CAN”T see,” I hissed back. “I’m cold, mamma,” Kasey stated. Eddie leans over the side of the boat in the dark. “It’s okay, guys. We are just fine,” I chirped in an octave way too high for my normal voice. Not only was I irritated and uneasy, I was keenly aware of major irony. Writing an article on river safety, I was hoping on this trip to get some photos of river obstacles that boaters should look out for including sieves, strainers and rocks. 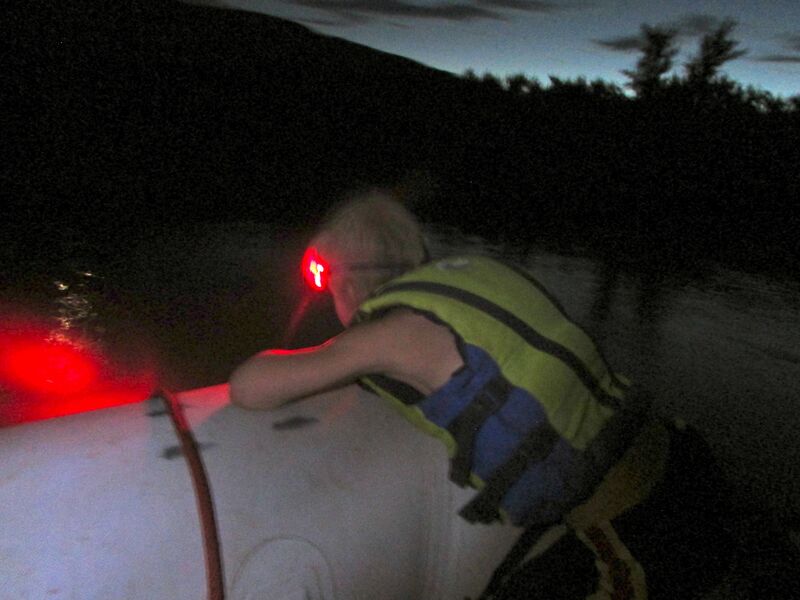 One of the tips I included in the article was DON’T Raft in the Dark because obviously you won’t see strainers, sieves and rocks. Now I had a first hand testimonial to work with. My foot illuminated by a headlamp. It’s dang dark. “I guess this is going to make a good Travel Oops to write about,” said Kurt, trying to break the tension. I did break out the camera and my iPhone to get some shots of us in the dark. After a few photos, I stopped since I could clearly hear the rush of rapids in the distance. Kurt and I both scanned the banks of the river for a place to pull over. 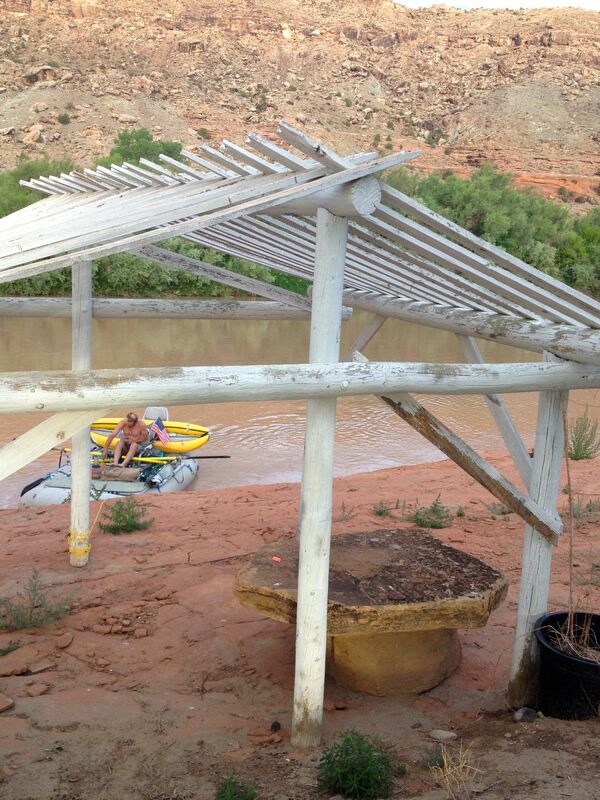 Perched High up on the red, precambrian rock right side of the river, a white worn down pergola practically beckoned to us. “Yes it is,” Kurt responded, already rowing over to the right. 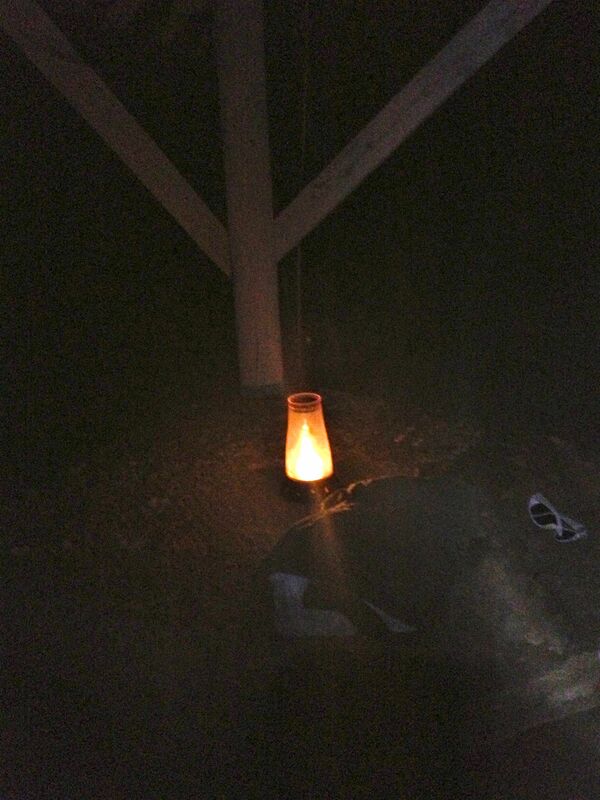 Kurt set a lantern on a rock table under the abandoned pergola. Creepy, indeed. After climbing up the side and tying the boat to the legs of the pergola, we looked around. Kurt lit a lantern and placed it on a rock table under the abandoned structure. The scene had the creepy, deserted yet watched feel of a “Blair Witch Project” moment. “I’m hungry,” mom. Eddie whined. “Me too,” said Kasey in a little voice. Kurt grabbed a can of Pringles from the raft and tossed it to me. 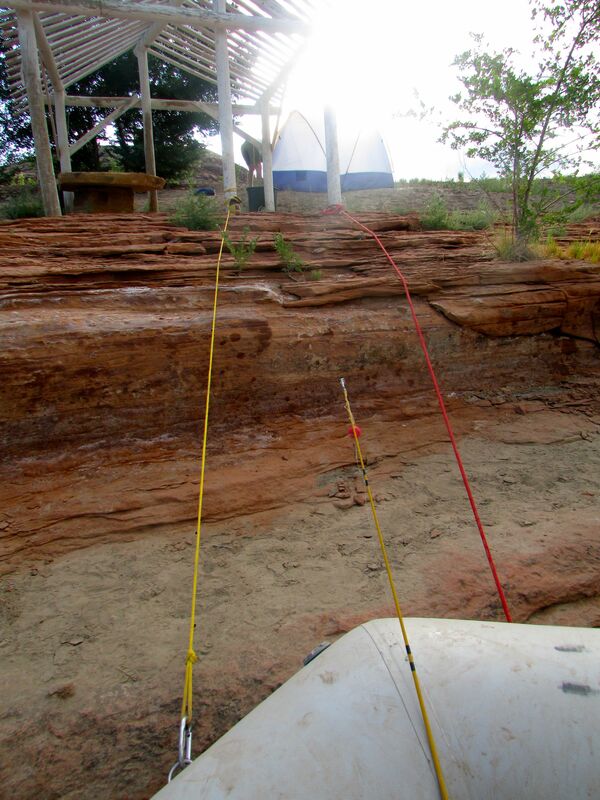 We set up the tent on a bit of a slope. 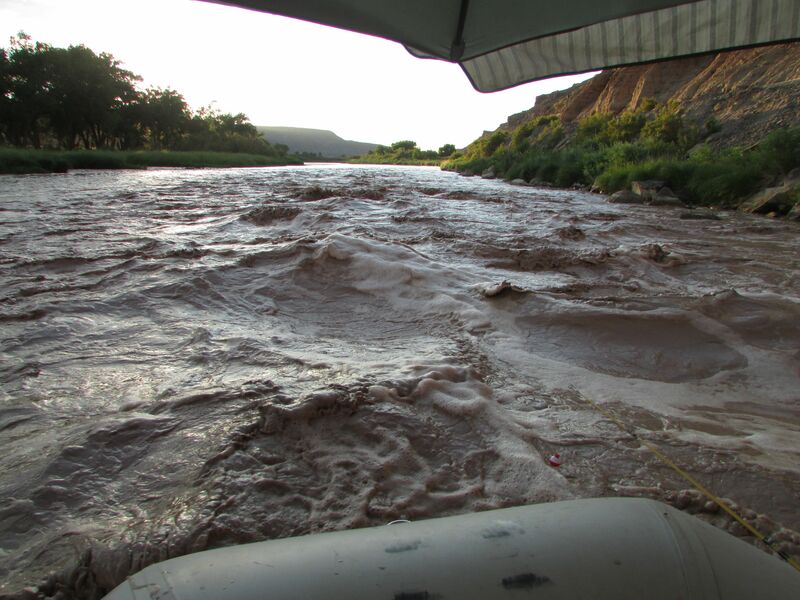 I just hoped a flash flood wouldn’t wash us into the river. Seeing a light shine from a distant house, we knew that it was official. This was private land. 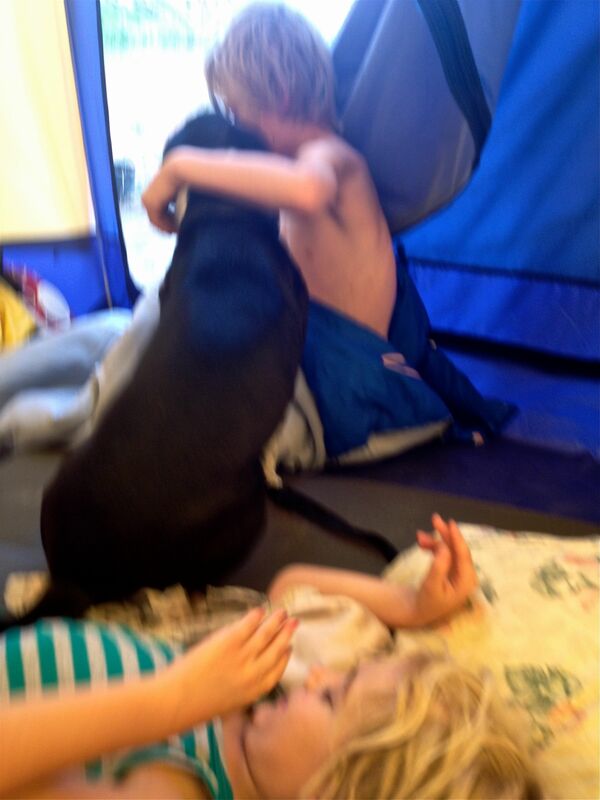 Too tired to worry about it, the four of us laid down in the tent. Ewell’s orchard. He grows peaches and nectarines. “So, you guys didn’t plan this very well,” Ewell maintains after we tell him about our saga. “Do you have a map?” He pauses. “It’s probably buried,” he adds. It’s clear and understandable that Ewell has absolutely no faith in us. He gives us directions to the canyon where Michael and company should be, wishes us good luck and leaves. However, 10 minutes later as we pack up the campsite, we hear gravel crunching. Ewell drives up in a truck. Ewell cuts up watermelon into slices. it’s a nice break from Pringles. “Thought you guys might like some of this.” He brings out two small watermelons. Eddie and Kasey run over to get some slices — even they are over the Pringles. “Wow, thank you so much,” I say. “You know,” Ewell continuea. “I want to help you guys. 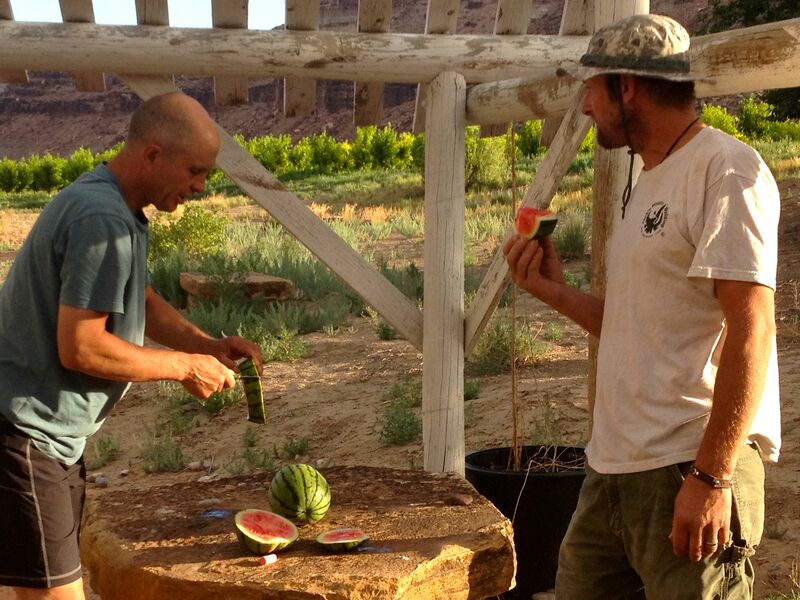 So I figure you can try to meet up with your friends and then stay an extra day in the canyon because you really should see how beautiful it is.” He takes a bite of the watermelon. Kurt loads up our raft. In daylight the pergola looked much less creepy. This is a moment when your faith in humanity is restored or reaffirmed, for sure. Honestly, I can’t believe the kindness Ewell is showing us although he probably believes we won’t get out alive unless he lends a hand. I’m guessing, at this point, Ewell’s faith in the human race is faltering. After Ewell leaves, I try to turn my cell phone on to add his number to my contacts, and the phone is completely dead. Apparently, the photos I took for Travel Oops used up all the remaining battery. Steph’s note: After pushing off from Ewell’s place we actually stopped at Dominguez Canyon. When we didn’t see our friends, we set off again. It turns out they were actually there and we just didn’t look hard enough or question the people who we encountered (one guy was actually part of their party). 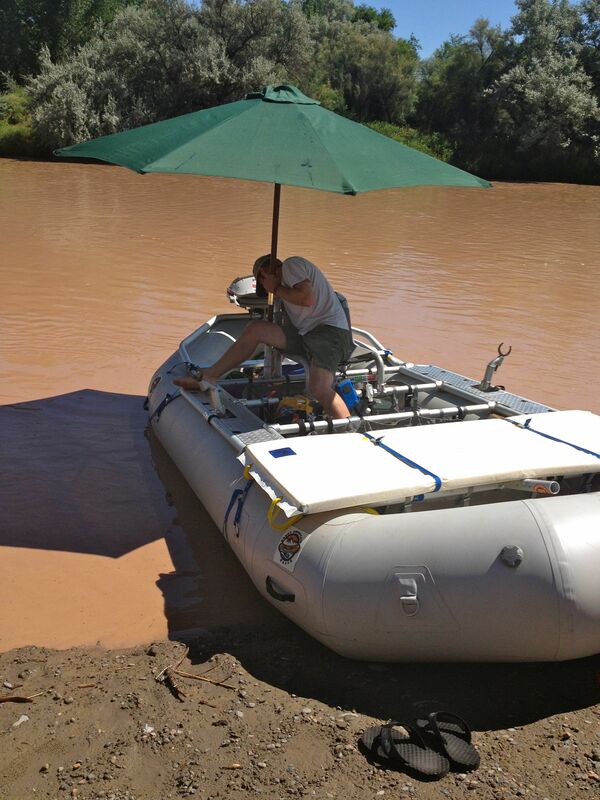 It turns out that we launched our boat at a further site that was 20 miles from where our friends camped (not 12)! At any rate, we made it to the take out, found Michael and company and got a ride back to our vehicle in Delta. I am adding Ewell to the Christmas card list. The beauty of Dominguez Canyon. We finally meet up with our friends at the takeout. 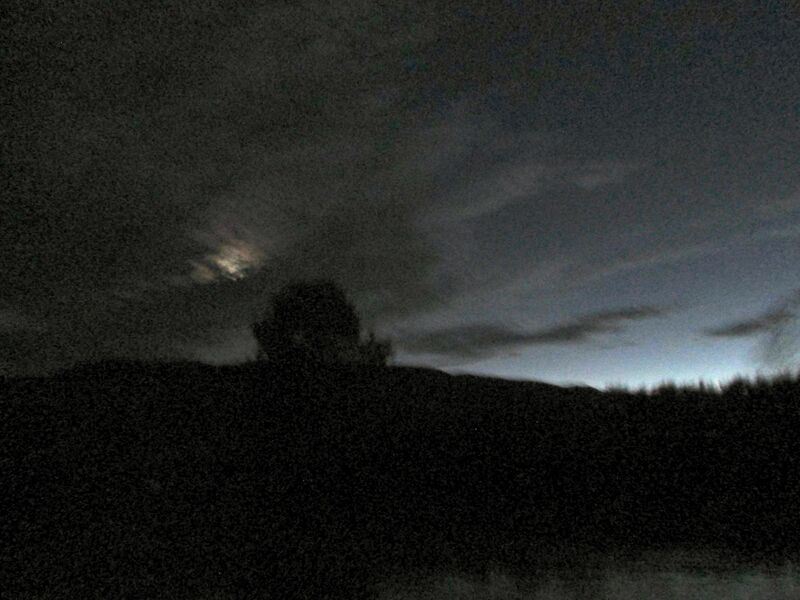 This entry was posted in Colorado, Family Travel, Nature, Rivers, Travel, Travel Humor, Uncategorized, United States of America and tagged Dominguez Canon, Gunnison River, river rafting in the dark, trespassing by stephglaser. Bookmark the permalink.